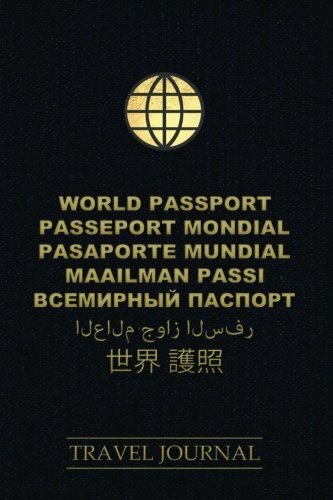 World Passport Travel Journal: 200 Pages, 6″x9″ ruled notebook, black cover, generous line spacing, easy on the eyes white lines on gray background for free writing, drawing, doodles, images etc. World Passport Travel Journal: 200 Pages, 6″x9″ ruled notebook, dark red antique cover, generous line spacing, easy on the eyes white lines on gray … free writing, drawing, doodles, images etc. World Passport Travel Journal: 152 colored Pages, 6″x9″ ruled notebook, dark blue antique cover, generous line spacing, easy on the eyes white lines … free writing, drawing, doodles, images etc. World Passport Travel Journal: 200 Pages, 6″x9″ ruled notebook, red antique cover, generous line spacing, easy on the eyes white lines on gray … free writing, drawing, doodles, images etc. World Passport Travel Journal: 200 Pages, 6″x9″ ruled notebook, yellow antique cover, generous line spacing, easy on the eyes white lines on gray … free writing, drawing, doodles, images etc. World Passport Travel Journal: 200 Pages, 6″x9″ ruled notebook, green antique cover, generous line spacing, easy on the eyes white lines on gray … free writing, drawing, doodles, images etc.